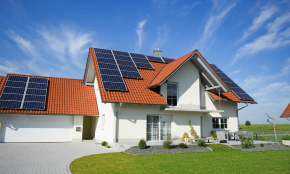 Solar energy makes financial sense, great return on investment. To be more energy independent. Where can a grid-tied solar system be used? Grid tied solar system are more applicable to commercial operations, with high daytime energy consumption. It is typically not a good fit for a home, if energy can not be exported or stored. This is because most of a household’s energy consumption is not at the times where solar energy can be generated. 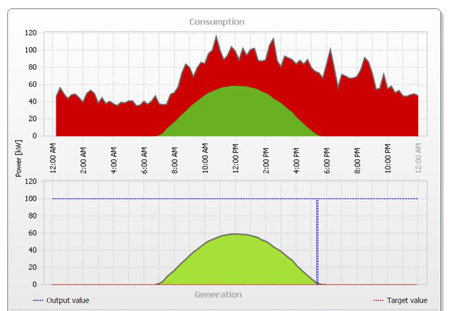 Most energy of a grid-tied solar system is generated between 9 am and 3 pm daily. During the day the array of photo-voltaic modules generates direct current (DC). The DC electricity is transmitted to the Grid Tied inverters to convert into usable alternative current (AC) electricity for the building’s needs. The Grid Tied inverters will synchronize with AC power from the supply grid. In the event when the building uses more electricity than the PV array can generate, the supply grid will be a secondary source of supply. Alternatively, excess electricity generated by the PV array will be channeled to the supply grid, subject to municipal approval. 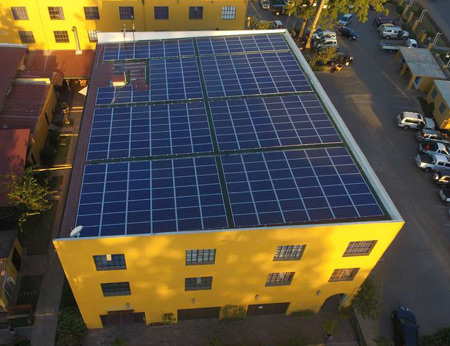 During the night the Grid Tied inverters will stop operation and the building will obtain electricity from the supply grid. 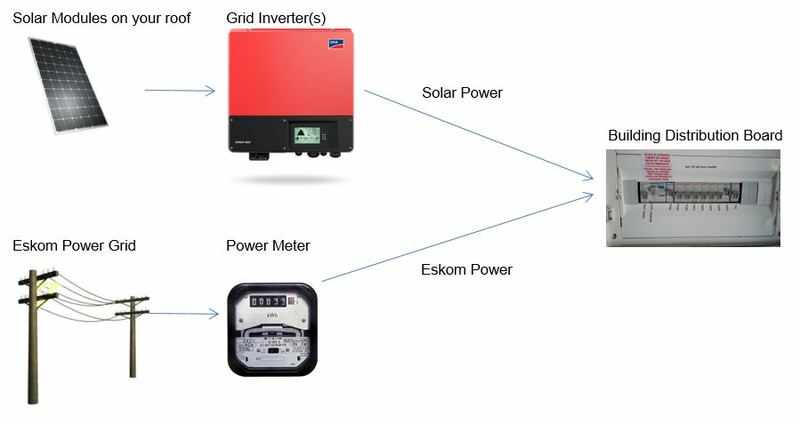 During power failures: As a safety feature, the grid inverters will cease to operate. This is to prevent islanding and provide protection to the electrical network. It is possible to design the system that it will still operate during a power failure. This will be an extra cost to the project and will require a site inspection with electrical engineers to establish current electrical reticulation and actual loads. 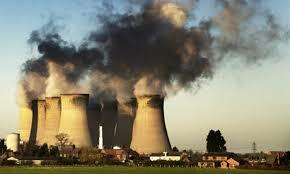 Biggest cause of air pollution. Expensive – High monthly electricity bills. Rising cost – large percentage increase in prices yearly. Free energy – No cost to produce the energy. Abundance of Solar energy in South Africa. Initial investment pays for itself within a few years. How do I determine what is the right size solar system for me? 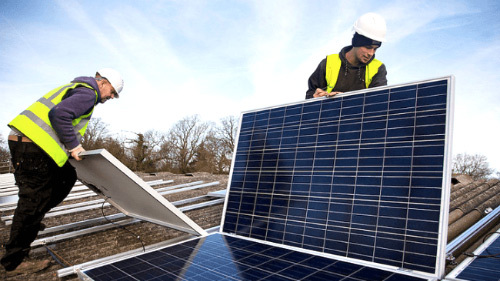 The best way is to arrange a site visit with one of our solar consultants. But for interest sake, your system size will be determined by the following three factors. What roof space do you have available? North facing roofs are preferably, as a North facing solar array will produce more energy, than other orientations. East and West facing roofs can also work, but will produce about 20% less power than a North facing roof. What is your yearly energy usage, or your monthly average usage? Your daily energy consumption will determine the amount of energy to be produced by your solar system. Daytime energy consumption will determine the solar system size and is typically 30% of your total energy consumption. How much do you want to invest in a solar system? Solar systems are very modular. You can start with a small investment in a 1 kilo Watt peak solar system, adding more later on. Solar systems are very easy to expand to larger systems. How quickly will a solar system pay for itself? In other words, what is my return on investment? Roof Orientation: North, 8 degrees slope. Note: This is a simplified calculation, one also has to take into account, rising energy cost, maintenance cost and energy output degration and other factors. To calculate your potential solar system size an return on investment we need to know what rate you are paying per unit of electricity, how much electricity you are using each month and what size system can fit on your roof. One of our experienced solar consultants will be happy to calculate your system payback for you. We take all factors into consideration when calculating system return on investments. Contact us today, and be part of the solution.